Our friends at CAMERA published a 2012 end-of-year top-ten list of the most egregious false accusations about Israel in the media. 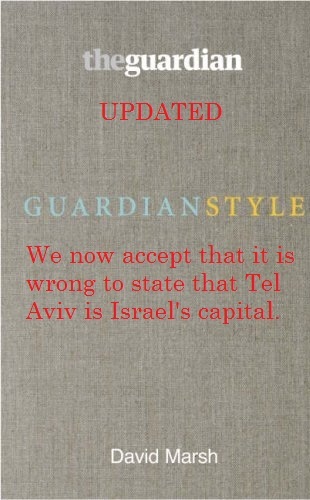 Coming in at number 5 was the Guardian’s ‘ever-changing Israeli capital. Washington DC, Canberra, Wellington, Brasilia and many others, all built on land stolen by white Europeans. I suppose these examples pass muster with the Guardian because Arabs are not involved? Soon they will refer to the Shoa as ‘alleged’. Soon [the Guardian] will refer to the Shoa as ‘alleged’. Israel’s right to exist was given by the UN in its early years. What was given by the UN can be taken away again by the UN, which it might well do at some time in the next decade. Your right to post can be revoked too. Beware. Aunty darling, in your dreams. The UN is a travesty of the rationale for its existence. I hope that soon IT will dissolve itself or be forced to do so. No chance, Israel declared itself as state, based on the UN resolution and was recognised by a lot of states, not Arab states of course. The UNO, financed by our tax money and Arab oil dollars has no power to withdraw a state declaration, stupid one. 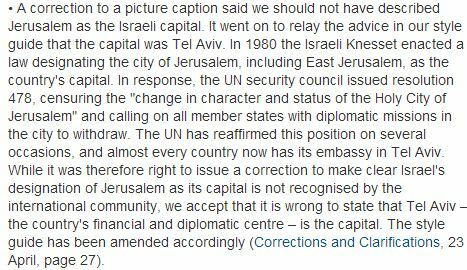 The wording in the correction speaks volumes: “we accept that it is wrong to state that Tel Aviv is the capital”, i.e. they first needed convincing before changing their petulant position.